This challan should not be used for deposit of self assessment tax for which a separate excel ITNS 280 Utility has been provided. A separate challan should be used for each type of payment by ticking the appropriate box in the challan. Apart from the above, the relevant code for the nature of payment is also required to be correctly filled. You are required to fill the TAN, Assessment Year, Amount, Cheques details (other than cash) etc. After the challan is paid to the bank, make sure that the counterfoil contains seven digit BSR Code of the bank branch, date of deposit and five digit challan serial number. 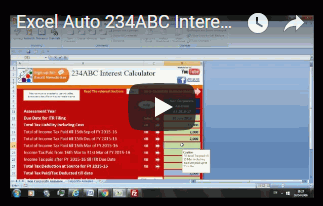 ABCAUS excel based auto TDS/ TCS Challan ITNS 281 is very simple and user friendly. The user is required to fill the data in a pop up form and challan form in excel is updated automatically. ABCAUS Excel Income Tax TDS Challan ITNS-281 Version 11.00 have an inbuilt database facility to add multiple assessee’s records and save them so that users don’t have to feed repetitive information for the next time for generating a subsequent challan for the same assessee. Also while creating the database there is an inbuilt TAN Structure check to alert for a wrong TAN structure being saved in database. Howver extreme care should be taken to ensure that the TAN should not only be structurally valid but should be an existing one that actually belongs to the assessee concerned. On the request of the users, an option to unprotect database sheet to fill the information directly in the cells have been provided in this version. However users should exercise extreme caution that only correct PAN is filled. List of various codes have also been made available in a popup box. Also the challan has been updated to provide for option to specify payment of late fee under section 234E. Users are not required to give blank spaces while filling the pop up Challan form. Dropdown list for various options and check boxes have been provided to save the time of the user. sir, please add “Telangana” state in your 281 challan excel database. the same has been updated now. Is there any rule in IT that TDS to be remitted to the department using ITNS 281 has to be done using ‘on-line’ (or net banking) route only? Is it not possible for a deductor to full out the form (281) physically and then go and pay it at their bank? What about deductors who may not have an internet banking facility? Please clarify. (b) A person (other than a company)liable to Tax Audit section 44AB are applicable. I have searched few sites for challan 281, but which is not user friendly like yours. Your form is easy to fill and saves our valuable time. We are request to you please send FORM TR-6 in excel for Custom Duties 0037 code.